Figure: Streamlines of the flow generated by a line vortex coincident with the -axis. 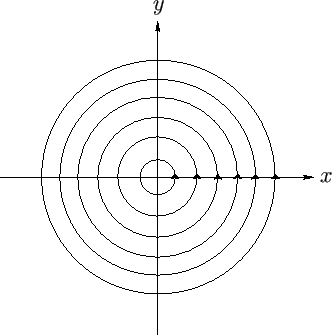 Note that the streamlines, , circulate around the -axis, as illustrated in Figure 5.5. Thus, we conclude that the flow pattern associated with a straight vortex filament is irrotational outside the filament, but has finite vorticity inside the filament. Moreover, the non-zero internal vorticity generates a constant net circulation of the flow outside the filament. In the limit in which the radius of the filament tends to zero, the vorticity within the filament tends to infinity (in such a way that the product of the vorticity and the cross-sectional area of the filament remains constant), and the region of the fluid in which the vorticity is non-zero becomes infinitesimal in extent. Note that the previous potential is multivalued. However, this does not cause any particular difficulty, because the potential is continuous, and its gradient is single valued.